We are very pleased to present the new Street View Inside Virtual Tour for The Bangkok Lounge Restaurants. 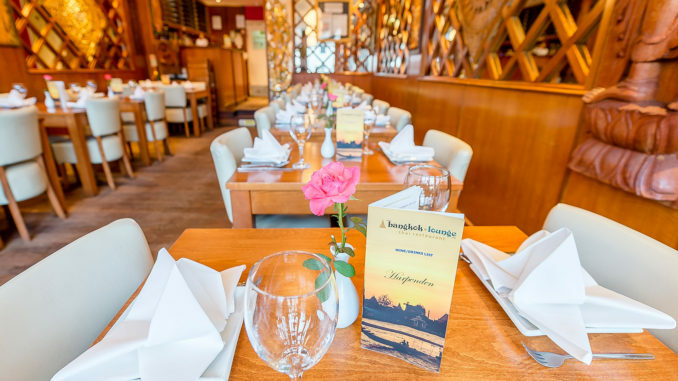 The Bangkok Lounge is a long established group of stunning Thai restaurants with premises in Harpenden in Hertfordshire and Shefford in Bedfordshire. Jo Hailey knew of the Harpenden restaurant and had visited there on a few occasions over the years. When the owner Motin Miah recently joined our networking group (BNI, where Jo is President), he found out about Striking Places’ services and booked us for both Harpenden and Shefford restaurants. When you first enter either of the buildings you are immediately struck by the beautiful traditional Thai decor. Lots of time and effort has obviously been spent on each and every detail and Motin and his team are rightly very proud of the results. Motin is a conscientious, successful businessman with a lovely way about. His hard work really shines through every aspect of the restaurants. The Bangkok Lounge pride themselves on authentic Thai cuisine in luxurious surroundings, so a Google Street View Inside and great imagery was a perfect way to capture the essence of the restaurants and keep them in the forefront of customers’ minds. One of the important aspects we wanted to feature was the intricate Thai artefacts and decor as they really do compliment your meal and add to the relaxing atmosphere. Jo shot each venue separately at just before sundown so we could shoot the outside in daylight and then take advantage of the dimming light to showcase the restaurants so that people would see it how they would as they were dining. Some of Motin’s regular customers showed up and joined in the fun by hiding around the corner so we could catch that perfect window of opportunity between the light fading and the customers arriving. The Street View Inside 360 Virtual Tour has been really well-received; Motin has embedded the tour into his website, it’s live on Google and the feedback has been superb! Shooting virtual tours and photography really works up an appetite, so Jo was over the moon to be able to experience again the Bangkok Lounge’s gorgeous cuisine on both days! Motin and the team looked after her particularly well at Shefford as she was dashing off to an event after the shoot; and the Hailey family was very appreciative of the takeaway she brought home from Harpenden!